James Bond had Q. You have ThinkGeek, the online clearing house for bizarre electronic wizardry. 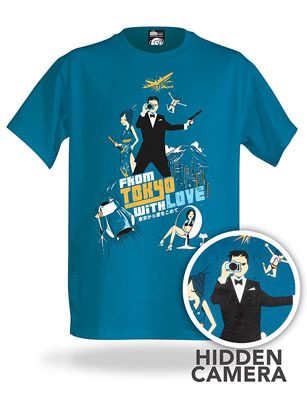 This t-shirt appears to be an ordinary piece of nerdy apparel featuring a Bond-like superspy wielding a camera. The catch is that it actually works: its eye is a functioning digital camera sewn into a shirt, so you can walk around capturing still images while those around you are none the wiser. Warning: your spy camera shirt may not capture evidence of a secret global conspiracy. That's sold separately.